Fight corruption in PGCPS. Innovate, Change and Transform – Create Transparency and Accountability Initiative. We hope you enjoyed Christmas, Hanukkah and Kwanzaa. As we write this, we are in day 6 of Kwanza celebration Kuumba. The sixth day of Kwanza, which occurs on New Years Eve, is a special day. This is the day of the Kwanzaa Karamu or Kwanzaa Feast. In the spirit of celebration many families invite their friends and family to join in the festivities. As we celebrate all these Holidays, Believe it or not, we are eternal optimists. We reject the corruption, nepotism and professional misconduct PGCPS management led by Dr. William Hite Jr is doing to citizens of PG County, at many levels in the schools. Dr. William Hite Jr does not think of the impact to lives before they retaliate and discriminate or create a hostile work environment so often. It is our opinions that without proper reforms and accountability, the cover ups involving corruption, professional misconduct and incompetence at Sasscer in many ways destroy lives. This has caused many families and children to engage in drugs and other forms of depravity. We have programs in most schools in PGCPS which employ the upper and middle class, but do not give children a sense of pride in themselves or a sense that they have a future. They are angry, poor and frightened. They steal to survive /and have become like young uncontrolled animals in some circumstances in many schools. To understand what is happening just visit the children court in either Upper Marlboro or Hyattsville Maryland to see for yourselves. Remember the AirJordans! But we have the power to change this! During 2012, you and your families will have to make a crucial choice, a choice about what type of leadership we need in our community. 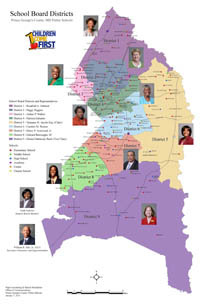 Because of a change in election law concerning the Prince George’s County Board of Education, five of the nine seats of the board will be up for election during the presidential elections. As you focus on what choice, remember to elect Board of Education candidates who will fight corruption and not make boardroom deals with a corrupt superintendent Hite. In the New Year, let us all try to work together to better the world for our children and grandchildren by electing new board members who mean well and are driven by transparency and accountability without wavering or vacillate irresolutely between choices . We hope when we write to you again in the New Year 2012 many things would have changed. Our prayer is to have a new superintendent. Period! Please remember us in your prayers and pray for our hard working student board member Faith Jackson who was left out in the official Christmas message cheer by Dr. William Hite Jr! Public Rally at PGCPS Sasscer Huge Success. The public rally at sasscer last evening (12/5/2011) was a huge success. Many people turned out in solidarity to show their disgust against the leadership of Dr William Hite Jr. There is need to treat workers with dignity and respect many speakers said. “The fight against nepotism, corruption and professional misconduct etc within the PGCPS school system must be won and won without much delay”. Several speakers among them Senator Joan Benson, Board Member Edward Burroughs III, NAACP PG chapter President Bob Ross, Local 2250 President Shirley Adams etc spoke to the crowd. (Below are some pictures). Public Rally at Sasscer today! A public rally will be held in front of PRINCE GEORGE’S COUNTY PUBLIC SCHOOLS ADMINISTRATION BUILDING – SASSCER in Upper Marlboro today December 5, 2011 from 4pm to 6:30pm – To protest nepotism, professional misconduct by senior PGCPS staff, discrimination, malfeasance, coercion, gross incompetence, corruption etc. Be there!